I talked about Tricare Overseas and home births a few months ago. Unfortunately, Tricare Overseas does not cover home births. Shame on them. Tricare claims their "primary objectives are to optimize the delivery of health care services in the military's direct care system for all Military Health System (MHS) beneficiaries and attain the highest level of patient satisfaction through the delivery of a world-class health care benefit." How they do that by limiting the choices women to giving birth by not reimbursing women for overseas home births by a midwife is beyond me. But let's not hold a grudge, let's talk about doulas. According to Tricare, they only cover medically necessary services. They specifically say they will not cover non-medical support during labor and delivery and mention doulas. Even though Tricare says they don't reimburse for doulas, some women have had doulas covered. Most hospitals and clinics don't break down their bills into super small parts. For example, while in the hospital, you probably interacted with a few nurses during your stay. However, when you get your bill, it's not likely that you'll be billed for each one. They often get lumped together. Or how about the secretary? You're not likely to see a fee on your bill for talking to her. Another example is your room. You are probably not billed individually for the water, electricity, or sheets that you use. There's probably just a room charge. Some birthing facilities include doulas in their fees and when they send you their bill, the doula is simply included. Sometimes the doula may be a nurse as well, so it's understandable that Tricare would reimburse families for this fee, especially if they provide medical services during your labor and delivery. Sometimes they're not nurses and Tricare still ends up indirectly covering the cost. HOW does this happen? Because it's included in the birthing fee. Some places may even charge the same amount whether or not you use a doula. It's kind of like the room fee. If you take super long showers, you're going to be charged the same amount as someone who doesn't take a shower during their stay. 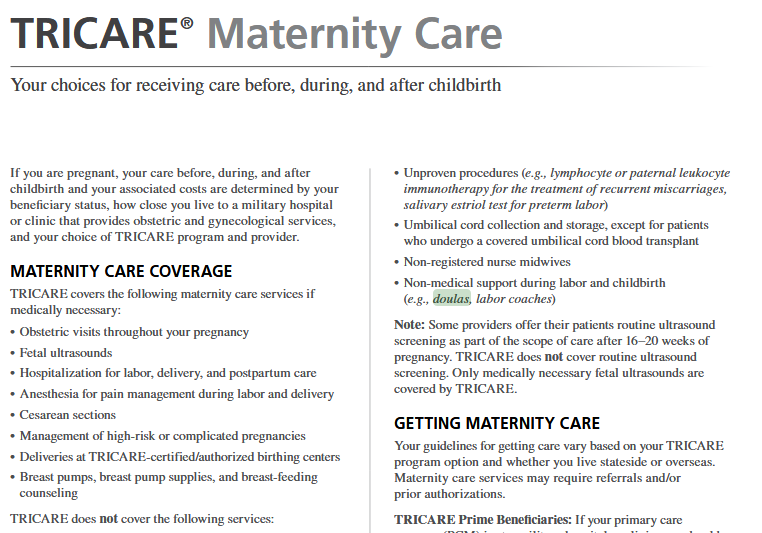 Depending on how your birthing facility breaks down their bill, Tricare may end up paying for your doula.